The Lair is in Sight! The day has come when you can finally confront an enemy previously cloaked in mist, hidden and impervious to retaliation. For the past 3 months, strange creatures known as Mist Men have plagued your village and roads, striking without warning or apparent purpose, only to vanish into the mists from whence they came. After their latest raid, however, they left something behind: a talisman found by a farm boy that will guide you to their hidden lair. Finally, questions will be answered, and revenge will be yours to savor! 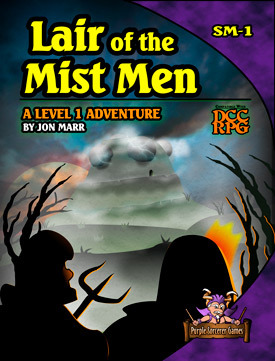 Battle the savage Greyfolk, guardians of the Sacred Rock to reach the Lair of the Mist Men! Experience sanity-stretching environments inside the Lair, and confront creatures too terrible for peasants to imagine! Uncover an entirely new threat that you can use to plague your adventurers for years to come! Full-color maps and art throughout all 11 pages. Your source for exciting, affordable, fun-to-play adventures compatible with the Dungeon Crawl Classics RPG from Goodman Games. ©2019 All rights reserved. Purple Sorcerer Games. Dungeon Crawl Classics and DCC RPG are trademarks of Goodman Games. For additional information, visit www.goodman-games.com or contact info@goodman-games.com.